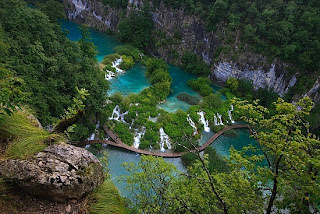 Treat your eyes with beautiful views of Plitvice Lakes National Park, a place in Croatia with sixteen lakes in it are connected by a waterfall terraces with different heights. Highest waterfall is 1.280 m, while the lowest 380m. Situated between the capital city Zagreb and Zadar, the National Park is a popular place among foreign tourists and has been named as a UNESCO World Heritage in 1979. 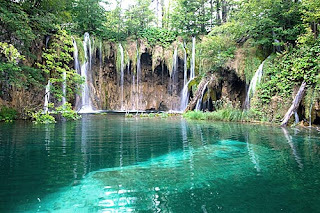 In Plitvice Lakes National Park is located in a wooded area with a population of animals such as deer, bears, wolves, boars and rare bird species. The park is open on weekdays and provide additional open longer hours in summer (7am-8pm). The entry fee is charged to visitors, will be used to maintain and protect the sustainability of the park. Do not miss the exciting facilities are boarding the machine that will take you from one side to the other lakes of the largest lakes. Enjoy traditional dishes typical of the region Lika, Croatia, disebuah Licka Kuca restaurant (Lika House) located at the main gate of the park. Not only in the summer of course you can visit the Plitvice Lakes, but any time in each season since the lake water discoloration. Even in winter this place was amazing to see with a sprinkling of snow on it. Strictly forbidden to swim in the lake or any part of the park because it is heavily fortified lake water to clean.